Infants and toddlers through age 4 are nurtured by caregivers in the Nursery rooms located downstairs across from Addis Hall from 9:30 – 11:00 a.m.
Delighting in the presence of children, we welcome members of our vibrant church school to participate in the first twenty minutes of worship with the congregation. Following Chancel Steps, those in pre-school through grade 6 go to Addis Hall for a time of biblical storytelling, song and prayer before going to their classrooms to engage in activities that extend the Bible story. We are presently using Seasons of the Spirit, a lectionary based curriculum. The 2018-2019 church school year begins on September 9 and will include a Blessing of the Backpacks during worship. Our Summer Church program, a one-room schoolhouse format, takes place during the month of June. This year’s summer theme is “Listening for God.” In July and August, child care for infants, toddlers and children up through grade 2 is provided. Older children are encouraged to worship with the wider church family. 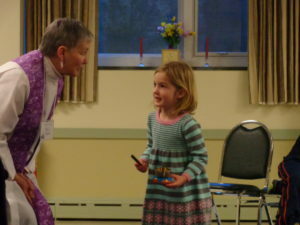 On Communion Sundays, the entire church family engages in intergenerational worship and celebrates the sacrament of communion; childcare is provided for young children under the age of 7. Our church school teachers bring a blend of experience, love of teaching and learning, joy, and patience to the classrooms. In an effort to ensure a safe environment for all, Edwards Church requires a background check (CORI) for all adults who interact with our children and youth. The Rite of Confirmation is celebrated during worship on Pentecost Sunday. An informational gathering for those in grades 9-12, along with their parents, will be held September 23 @ 11:15 in the Edwards Room.